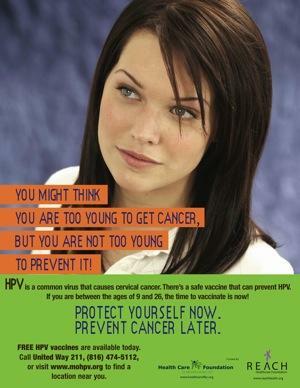 This article first appeared in the St. Louis Beacon: May 27, 2008 - Health-care officials in Missouri are gearing up for a major campaign this summer to convince uninsured, low-income women to take advantage of free vaccinations to guard against human papillomavirus or HPV, which can cause cervical cancer. The campaign is part of an $11 million HPV project funded by the Missouri Foundation for Health. Plans call for a series of radio announcements, continuation of an advertising program through the online MySpace site, distribution of informational posters and leaflets and increased efforts to educate church and community leaders about the importance of the vaccine. "There is still misinformation (about the vaccine) out there," said Allison A. Atterberry, a registered nurse and HPV vaccine project coordinator for the Missouri Family Health Council Inc., one of the organizations receiving funding from the Foundation of Health for the project. "One of the biggest fears is that the vaccine hasn't been studied long enough; some mothers are still afraid of what it might do to their daughters." Atterberry said that seven years of studies in Europe showed no serious problems associated with the vaccine. The HPV vaccine, with the brand name Gardasil, targets certain strains of the human papillomavirus that account for 70 percent of cervical cancers. The normal cost of the vaccine is $360 for a three-dose regimen over a six-month period. The Missouri Foundation for Health first announced its $11 million HPV vaccination grant -- with the money divided equally between the Missouri Family Health Council and the Missouri Primary Care Association -- in January 2007. In recent months, though, health officials have become increasingly concerned that many women and girls who needed the vaccine were not getting it. Bev Pfeifer-Harms, with the Missouri Foundation for Health, said she has been directly involved in sending out letters in early March to about 3,000 churches in the foundation's service area. A second, follow-up mailing to those same churches will go out in the next few weeks, this time with copies of a brochure and flyer developed by Missouri Family Health Council, she said. She said she has received no criticism from church officials in the region as a result of the March mailing, despite controversy over whether the vaccine encourages sexual promiscuity. "We did not get a single negative response back," she said. Health officials say they do not know how many families may be opting out of the vaccine because of moral concerns. The National Catholic Bioethics Center calls the vaccine "a morally acceptable method of protecting against the disease," but says the best way to avoid contracting the virus is to "abstain from sexual relations before marriage and remain faithful within marriage." The center also asks that the decision on whether to immunize remain within the family and not be made mandatory. "This is a disease prevention issue," Pfeifer-Harms said of the vaccine. "We're not in the business of discussing morals or sexual activity. That's a discussion for parents to have with their kids." The $11 million grant is enough to pay for vaccinations for 30,000 girls and women who are not covered by insurance or who do not qualify for Missouri's free Vaccines for Children program. Pfeifer-Harms said she estimates about half of that target number have been vaccinated through the program to date. She said health officials do not know how many more girls and women who would benefit from the program have not taken advantage of it. The Missouri Foundation for Health grant was the idea of foundation board member and private OB/GYN physician Sandra Ahlum of Hannibal. She said that while the program has been successful, there is still more that can be done. She said some girls and women who "have been already sexually active, or already are pregnant, or already have had an abnormal PAP smear" believe they do not qualify for the vaccine. "That is not the case," she said. Also, she said, patients who have started the series of shots need to realize the importance of finishing the series. Plans call for the MySpace ads to run at least through July 15. Center locations are available by calling 2-1-1, a free helpline that connects callers to health and human services assistance, or by calling, toll free, 1-800-427-4636. Beginning next week, a six-week radio advertising campaign will run on MissouriNet and on stations in St. Louis, Columbia, Cape Girardeau and Springfield. The summer campaign also includes exhibits at area health conferences, additional work with school nurses throughout the state and the creation of posters for exhibits and clinics. A second six-week radio campaign is set to begin in late August. "We still need a lot of general publicity," Ahlum said. "But we also need continued promotion with health-care providers, so that every time someone in this age group come in to the medical office, for whatever reason, she be asked about whether she has received the vaccine."